Will Golson paddling Windy Hole, the first rapid. Dave Hoag observing from a rock on the left. Date: Friday evening camp at Six Mile Gap campground, July 18, 2014. 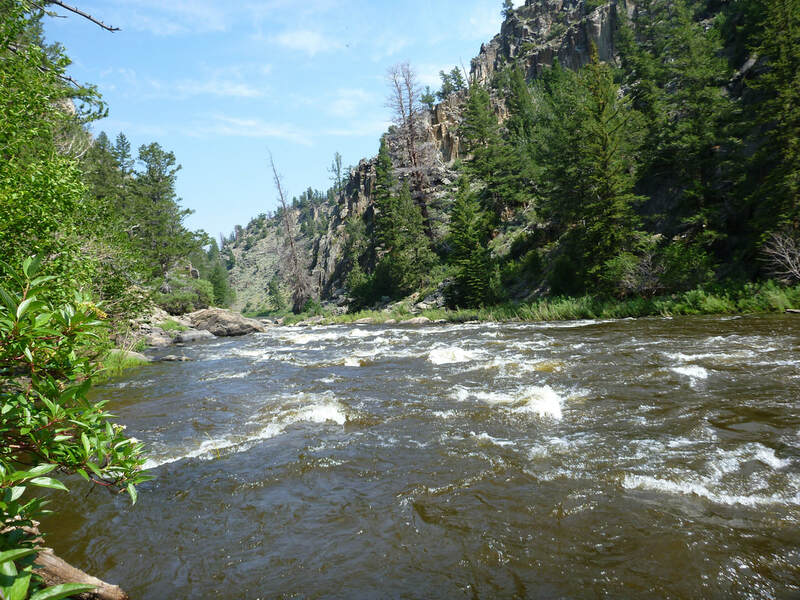 On Saturday, meet at 9:00 am at Routt Access on the North Platte River in Colorado. 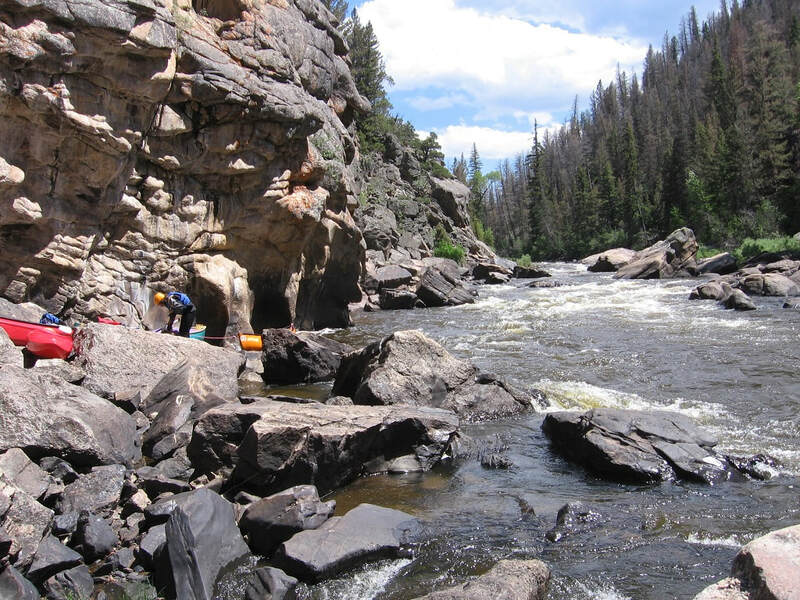 Overview: We float a total of about 10 miles from Routt Access to Six Mile Gap campground. We are camping the night before so we can get an early start to avoid afternoon thunderstorms. 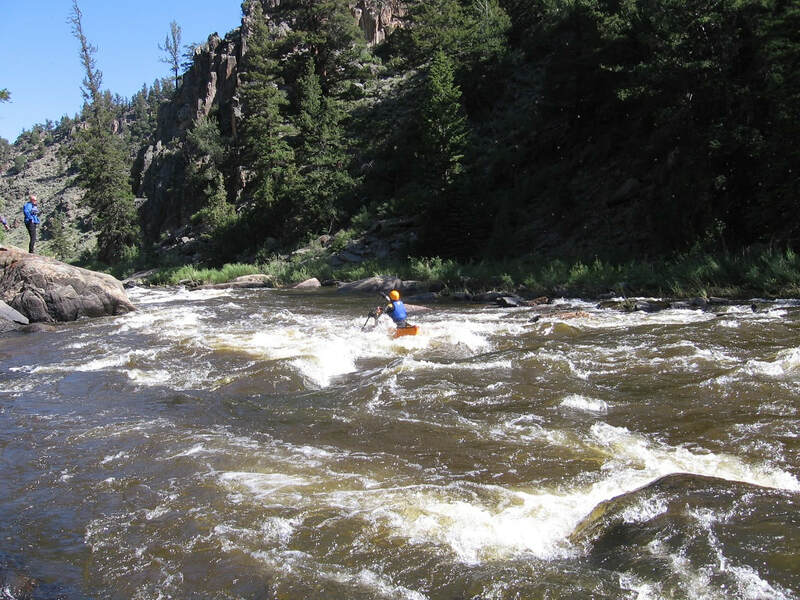 We will float through the Platte River Wilderness area. This is a beautiful pine forest area. We start the float at an elevation of over 8,000 feet, so be prepared for cooler weather. This is just a day trip, so you don't need to carry camping gear in your boat. Just take the usual sack lunch, rain gear, water, suntan lotion, etc. 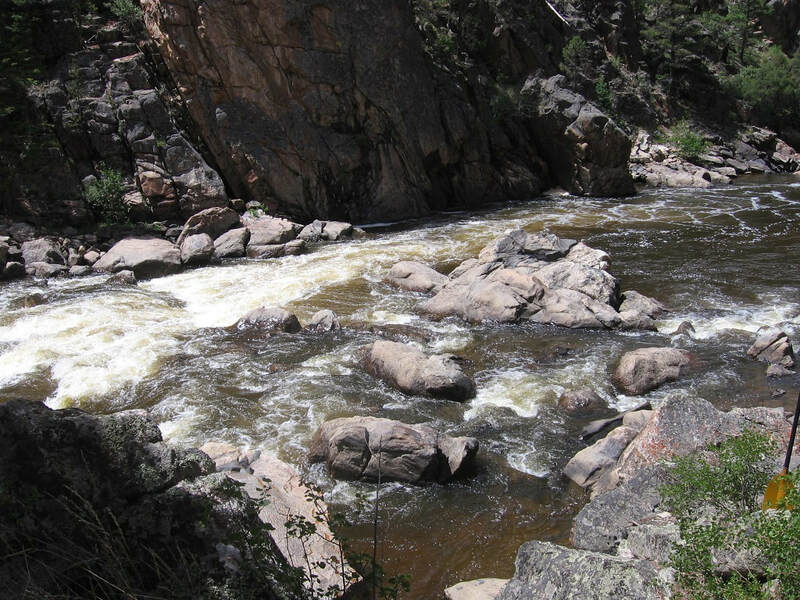 Class: Under 1000 cfs, all the rapids are Class III, except Windy Hole which is a Class II. Narrow Rapids (North Gate or O.F.R.) can be scouted and portaged on river right. 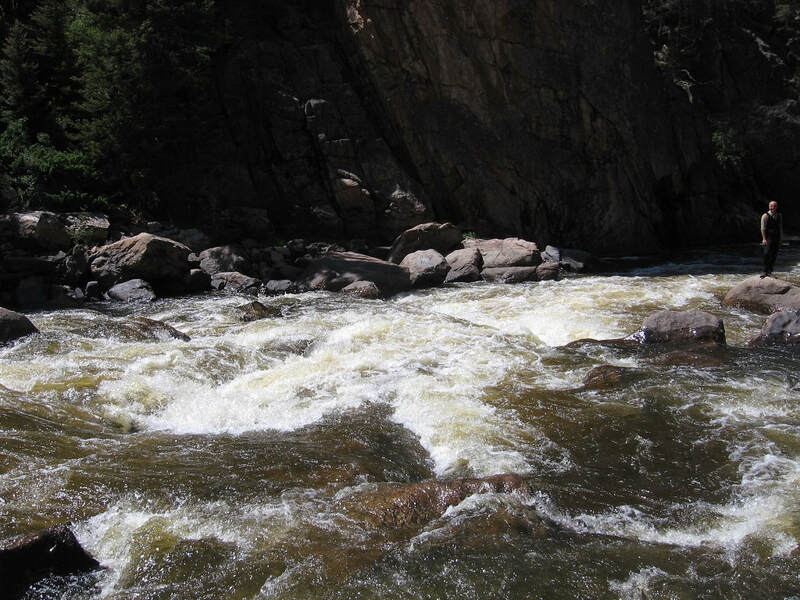 The other rapids are more difficult to scout by land. Sometimes scouting by land is more dangerous than floating the rapid. Scouting by eddy hopping is a good technique to master. Canoeist sit higher and can see better down the river than kayakers, so it is good to follow a canoe. Wyoming Decal: If you are floating a boat in Wyoming, you need to purchase an invasive species decal. Only inflatables of 10 feet or less are exempt. You can purchase the decal for $15.00 at this link or at any store in Wyoming that sells fishing licenses. If you order online, you need to have a printer so you can print a receipt that is good for 15 days. They will mail you the actual decal within 10 days. We were checked on the North Platte river once. You need a separate sticker for each boat you float in Wyoming. The money goes to trying to keep invasive species out of Wyoming. Wyoming Inspection: All boats have to stop and be inspected as they enter the state during the summer months. That includes canoes and kayaks. The inspection stations are only open certain hours, so you will have to plan your trips accordingly. This will affect all floats on the North Platte. If you plan on driving up 287 to Laramie, then the inspection station is at the Port of Entry, 1 mile south of Laramie. The link below will show the inspection stations. Friday afternoon: The drive from Northern Colorado to Six Mile Gap campground takes about 3 hours. Take 287 to Laramie. Stop at the Port of Entry 1 mile south of Laramie to get your boat inspected. Go west on I-80 and immediately exit on Wyoming Highway 130 Snowy Range Road. Then go south on Highway 230 from Laramie, which goes back to Colorado and becomes Highway 127. When 127 and 125 cross, take 125 north towards Saratoga. As you leave Colorado, 125 turns back into 230. Follow 230 north. 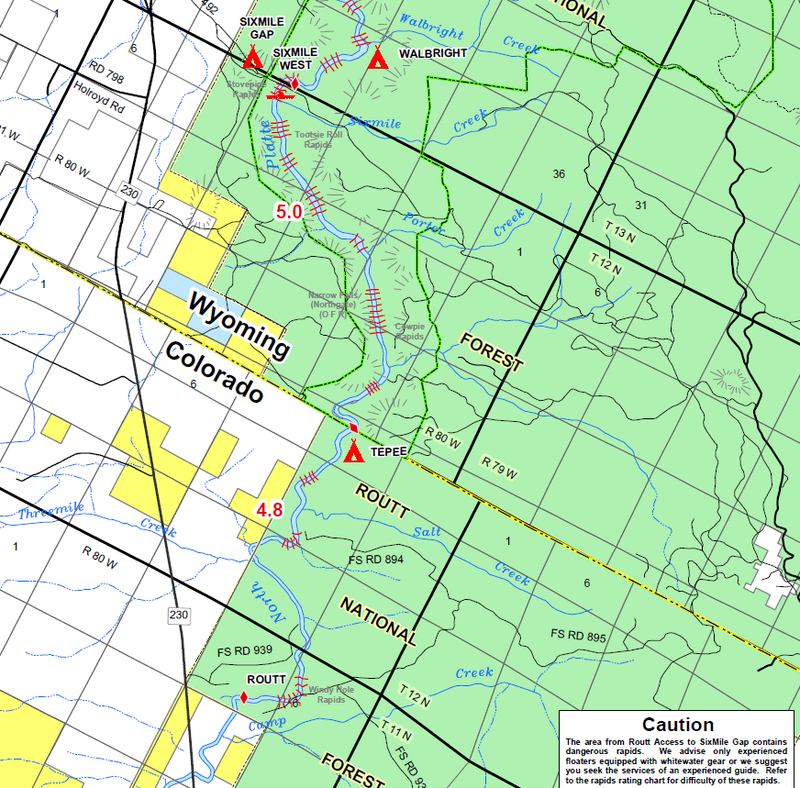 About 6 miles north of the Colorado Wyoming border is the road to Six Mile Gap campground. The road is 492 or Six Mile Road and it leads to the campground. Make sure you go to Six Mile Gap and not Routt. Routt is our put-in, but it is not as nice to camp there. 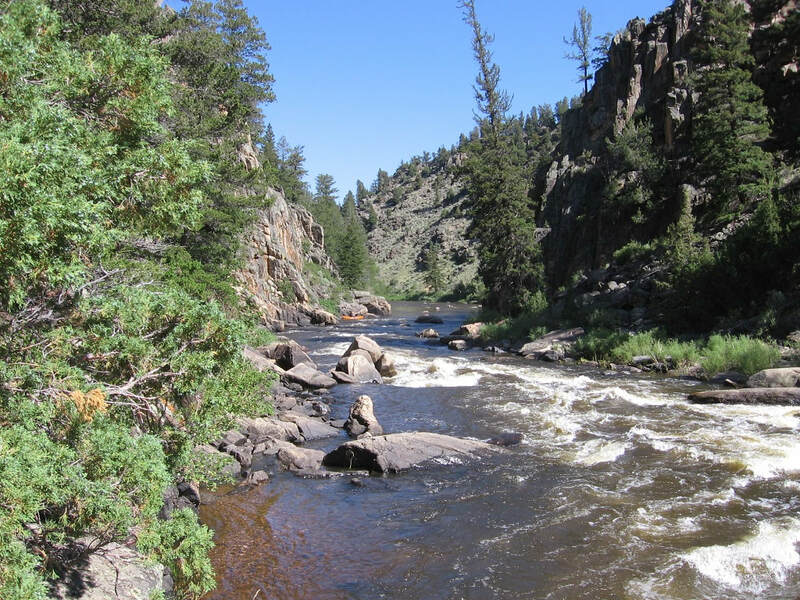 You will drive past Routt access just after you cross the North Platte River. Six Mile Campground is further up the road and in Wyoming. 9:00 am, Saturday: Drive to Routt Access, which is in Colorado. It is about 9 miles south on Highway 230. Unload your equipment by the river. There is a slide to slide rafts down into the water. It works for boats also. 9:30 am, Saturday: One person per car will drive the shuttle to Six Mile Gap. The others will continue rigging the boats. The shuttle is about 9 miles. 10:00 - 10:30 am, Saturday: Go over safety rules, and then finally start paddling. The fast section of Narrow Rapid. This is also called North Gate Rapid, or O.F.R., or Narrow Falls, or The Gate. Dave Hoag observing. Contact: If you have questions, contact Roger Faaborg. roger@rff.com, Home phone: 970-669-4182. Make sure you notify me if you are interested so I can contact you about any changes to the trip.